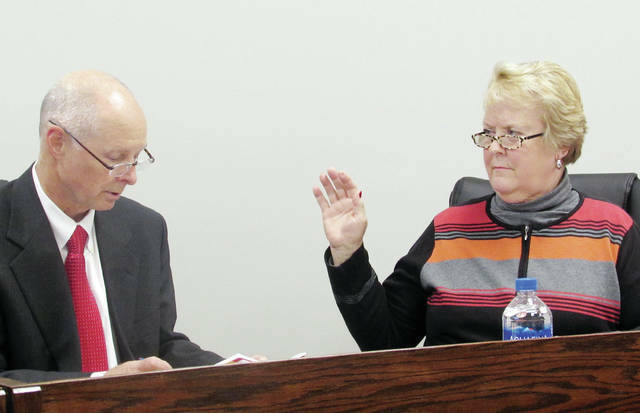 The Wauseon school board voted Monday to retain member Sandra Griggs as president. She was sworn in by David Fleming, district treasurer. Member Larry Fruth, who was not present, was retained as vice president. 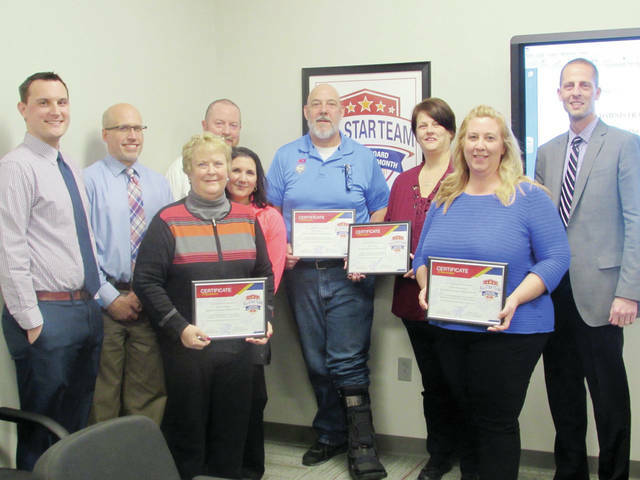 Wauseon school board members were recognized for their service at Monday’s meeting. Pictured are, from left, Blake Young, WPS principal; Ryan O’Dell, WHS assistant principal; Sandra Griggs,, board president; Joe Friess, WMS principal; Theresa Vietmeier, WES principal; Rick Stidham, Amy Fisher, and Stacia Radabaugh, board members; Keith Leatherman, WHS principal. Along with its regular meeting, the Wauseon Board of Education held an organizational meeting Monday to establish policy for 2019. The board voted at that meeting to retain Sandra Griggs as president and Larry Fruth as vice president. The members also retained the current meeting schedules: the second Monday of each month at 5:30 p.m. at the district’s administration building, 930 E. Oak St., and the fourth Thursday at noon at a selected school building. Noon meetings will not be held May to August and in November and December. Superintendent Larry Brown was named the district’s purchasing agent, and the school district’s credit card limit was set at $75,000. Griggs, Brown, and Treasurer David Fleming were named to the Establish Records Commission. Fruth was named the board’s legislative liaison, and member Stacia Radabaugh the student achievement liaison. During the regular meeting, donations approved included: $2,016 and $1,294.64, respectively, from the Tomahawk Wrestling Club to the Wauseon Athletic Department for wrestling state championship rings and wrestling tournament hotels, respectively; $800 from VFW Post #7424 in Wauseon to the Wauseon Athletic Department for JH football practice jerseys; student hats and gloves from Christ United Methodist Church to Wauseon Primary School; multiple animal bones from Brookview Farm Meats and BBQ to Wauseon FFA for educational purposes. Motions were also approved for an alternative tax budget requested by Fulton County Auditor Brett Kolb, including the school district’s five-year forecast and debt service schedule, and the adoption of a resolution accepting amounts and rates determined by the Budget Commission, and authorizing and certifying necessary tax levies. In personnel matters, the board approved: Sabrina Hartson for a one-year limited classified contract as a high school two-hour cook, effective Jan. 15; Christian Crew and Mike Webster, one-year limited certified athletic supplemental contracts for JH track; Pat Carr, volunteer bowling coach; Dylan Leu, Brandon Schantz, and Jack Warncke, volunteer baseball coaches; and Ann Oberski, Wauseon Public Library Board of Trustees, December 2018 to December 2025. Board members passed a motion authorizing Superintendent Larry Brown to enter a purchase agreement with Cardinal Bus of Lima, Ohio, for two 84-passenger Bluebird transit buses totaling $182,720. They also approved creation of a Vocal Music fund. Overnight Speech Team trips were approved to: Wooster Speech, Jan. 18-19, Wooster, Ohio; Ohio Speech and Debate Association Finals, Feb. 28-March 3, Massillon, Ohio; National Speech and Debate Association District Congress, March 15-16, Columbus, Ohio; National Catholic Forensics League National Finals, May 23-27, Milwaukee, Wisc. ; and the National Speech and Debate National Finals, June 15-22, Dallas, Texas. • Primary school principal Blake Young reported the Ohio Department of Education listed the preschool program compliant after holding a surprise inspection. He said parents of next year’s kindergarten students can begin making appointments Feb. 1 for the March 21-22 registration days. “Possum Tale,” the second grade musical, will be held Feb. 12, at 2 p.m. and 6:30 p.m.
• The elementary school teachers will have 24 relevant topics to choose from during a conference-style in-service Friday, Jan. 18. Principal Theresa Viemeier said they include special education, depression, anxiety, vaping, and literacy. Vietmeier said third graders who struggle with reading will be tutored through a partnership with Crossroads Evangelical Church. Some teachers and aides will be trained in PAX, educational strategies that help students learn self-management. Math Night will be held Tuesday, Jan. 22, 6 p.m. Fourth and fifth graders will participate in the Fulton County Spelling Bee on Feb. 5. • Middle school principal Joe Friess said the students continue to work on improving the school’s positive climate initiative. • High school juniors will take the ACT test Feb. 12; those with accommodations will take it Feb. 13. Spring testing includes: English/language arts, April 9 and 11; American History and government, April 24; biology, April 26; Algebra I and geometry, April 30 and May 2. Upcoming musical events include the Fulton County Honor Festival, Archbold High School, Feb. 9-10; High School Solo and Ensemble, Bryan High School, Jan. 26; Ohio Music Education Association District 1 Honor Festival, Stranahan Theater, Toledo, Feb. 17. Scheduling presentations include sophomores, Jan. 23; juniors, Feb. 4; freshmen, Feb. 11; eighth graders, Feb. 19, with parents meeting Feb. 12. The school board entered into executive session to discuss employment of personnel. No action was taken.